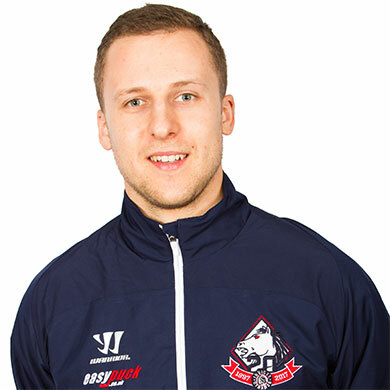 Ondrej Zosiak might originally have been a late addition to the roster when he first signed ahead of 2015/16 but he quickly established himself in the NIHL South’s top tier to became one of the players Head Coach Kevin Parrish has most wanted to tie down to a new contract each season. The Slovak blue liner arrived in Gillingham with an excellent pedigree – including over 100 appearances in the Extraliga back home and spells in both Austria and Poland – and has since been near ever present for the Dynamos having featured in 139 fixtures for the Mos over the last three campaigns. Ondrej Zosiak’s first year in Kent saw him ice in all of the club’s 50 games and he firmly established himself in the NIHL South with 8 goals and 24 assists for a total of 32 points. His displays were recognised by his peers across the division with the defenceman voted into the prohockeynews.com All-Star line-up by players throughout the league. In Gillingham he was also singled out for recognition – the blue liner picking up the team’s ‘Player of the Year’ award at the end of season presentation evening following an excellent debut campaign. In April 2016 Ondrej Zosiak signed an extension for 2016/17 and he was just as valuable an asset to the club in his second term – again finishing the year with a place in the prohockeynews.com All-Star line-up and walking away with the club’s ‘Player of the Year’ accolade. During the campaign the skater iced on 46 occasions, scored 12 times and claimed 16 assists for a total of 28 points. His presence was also a major factor in helping the team secure their first silverware since 2015 as the Mos overcame the Chelmsford Chieftains to take the NIHL Southern Playoff title. Hot on the heels of lifting the playoff trophy, Ondrej Zosiak signed up for a third term at Planet Ice Gillingham in what was to be a much tougher year for the Dynamos following a league restructure that now saw them compete in the country’s second tier. Nevertheless the sizeable Slovak still made his mark with 3 goals and 11 assists in 42 fixtures and the team relying more heavily on his defensive prowess in the face of new and tougher competition. Once again he drew praise at the club’s end of season presentation evening – completing a hat-trick and claiming a third ‘Player of the Year’ award in three seasons. Now he commits to a fourth year in the NIHL South Division 1 with the Dynamos where he has firmly established himself as a fans’ favourite.